THQ says its preliminary fourth-quarter financial results are stronger than expected. The beleaguered THQ is far from out of the woods yet but the "preliminary, unaudited" financial report for its fourth fiscal quarter is a little ray of hope that perhaps things are starting to look up. The company said that non-GAAP net sales for the quarter are expected to be in the range of $160 to $170 million, well above the previous non-GAAP outlook of $130 to $150 million, driven by continued strong sales of Saints Row: The Third, which has now shipped more than four million units, strong digital sales behind Saints Row: The Third DLC and "slightly higher-than-expected" sales of UFC Undisputed 3. The relatively strong results plus "earlier-than-anticipated cash receipts" - which as far as I can tell is accountant-speak for getting paid without having to break any arms - means the publisher expects to report roughly $76 million in cash and cash equivalents for the end of the year, triple the amount it had originally forecast. It's worth bearing in mind, before we get too excited about the dawn of a new day, that this isn't so much good news as it is merely less-bad. THQ will still report a non-GAAP net loss per share, but in the range of $.10 to $.20, rather than $.35 to $.50 as previously expected. 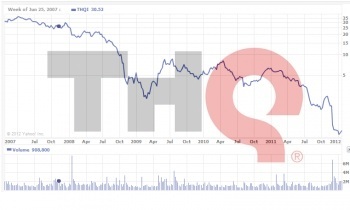 It's definitely an improvement, but THQ is still in the tank. Furthermore, the situation appears to be improved almost solely thanks to the success of Saints Row: The Third, which reflects the common complaint that THQ is a one-trick pony. Saints Row is its biggest gun - and in the grand scheme of things, it's not all that terribly big - but beyond that, there's just not a whole lot else in the arsenal. Still, the news is about as good as it gets for THQ right now and the company's share price reflected the improved situation, opening today at $.65, a jump of nearly 50 percent over yesterday's closing price of $.45. That's still a long way from the minimum $1 demanded by NASDAQ, but if THQ can stick in that range for awhile, it might be enough to dodge the delisting bullet. THQ will report its full GAAP and non-GAAP fourth quarter and full fiscal year 2012 financial results on May 15.